EM 3732, Transmitter/Receiver from Sennheiser. Sennheiser is now shipping the EM 3732 twin receiver with 90MHz switching bandwidth that offers automatic scanning functionality, choice of five frequency ranges, transmitter synchronization via infrared interface, and analogue and digital connection options. The EM 3732 receiver features six user-selectable fixed frequency banks and one user bank with up to sixty channels that can be programmed in increments of 5kHz. The EM 3732 automatically searches for free frequencies within a frequency bank. An integrated antenna splitter allows up to eight EM 3732 twin receivers to easily be daisy-chained. Sennheiser says that the EM 3732 is suited for large multi-channel applications, not just because of its wide switching bandwidth and tunable channels, but also because of its infrared interface, which programs SKM 5200, SK 5212 and SKP 3000 transmitters with the receiver data via a Hot Key. Frequently used menu items can be accessed directly via convenient Hot Key shortcuts. Both receivers can be monitored via headphones individually or simultaneously. 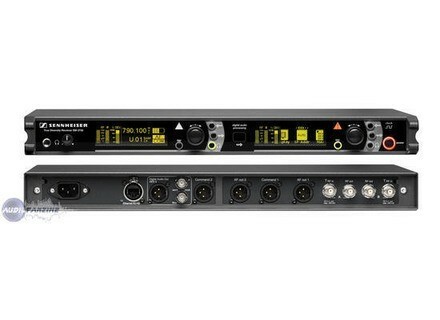 Sennheiser tells us that output level can be set in increments of 1dB and is available at a transformer-balanced XLR-3 analogue output as well as an AES3/EBU audio output for direct connection with digital mixing consoles. Digital synchronization of the 44.1kHz, 48kHz, 88.2kHz or 96kHz/24-bit sample rate can be generated internally or accepted from the digital audio mixer via a BNC connector. The high level of audio quality is further maintained through the use of a DSP-based HiDyn plus expander rather than analog circuitry. The EM 3732 (MSRP: $6,219.00) is complemented by two variations: the EM 3731 single receiver (MSRP: $4,739.00) and the EM 3732 COM twin receiver (MSRP: $7,149.00), a special command version with a second XLR-3 audio output for talk-back purposes. All models will be available in April 2008.